The OEM also released a handy video Jan. 11 explaining how to use the CONSULT scan tool. Despite the specific mention of the year 2008 near the document’s end, the first half of the Jan. 7, 2019, position statement (and a virtually identical one for Infiniti) suggested shops would need to post-repair scan at least some older Nissans as well. A Nissan collision program representative later confirmed Nissan still recommended post-repair scanning pre-2008 models too. Nissan certified collision growth program administrator Chad Gough on Wednesday wrote that Nissan did suggest scanning pre-2008 cars too. Nissan also continued its 2016 policy of advising — but not mandating — a pre-repair scan in the document. The position statement stressed again that dash lights don’t reflect all possible diagnostic trouble codes. “The proliferation of vehicle control systems has increased the potential number of DTCs beyond the point where dashboard indicators can illuminate for every DTC,” the OEM wrote. “The dashboard indicators are intended for driver notifications, NOT vehicle diagnostics. The repair as well as the crash can trigger codes, Nissan also noted. “I thought it was pretty clear,” he continued then, drawing laughter. 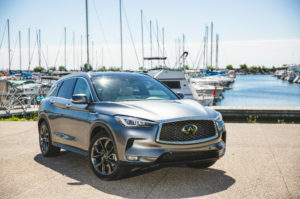 He said he clarified it further in the Sept. 15, 2016, Infiniti position statement to explain that “anything that can be plugged in with the console and read” — essentially, everything with the OBD-II port — should be scanned. “That would apply to Nissan as well,” Miller said in November 2016 of the Infiniti statement. He also said then that Nissan had two 1995 models requiring scans. For all intents and purposes, even if Nissan had actually said that no scans were required for cars older than 2008, it might as well still be saying “all,” since many older Nissan and Infinitis are likely to be automatic totals anyway. The average total loss vehicle in 2017 was only 9.64 years old, 9.73 years if you throw out Hurricane Harvey, according to CCC. The valuation average if you don’t count Harvey was $9,125, $8,943 for Asian vehicles. For context, a base 2008 Infiniti G35 Journey sedan in Infiniti’s Tennessee P.O. Box ZIP Code was only worth around $8,052, according to Kelley Blue Book. A QX56 was worth around $12,167.